Powers/Abilities: Pascal Tyler's Guardsman armor possessed the standard capabilities of the Guardsman armor units, including enhanced speed, enhanced strength, offensive weaponry, and flight capabilities. In addition, Tyler briefly wielded the Wizard's anti-gravity technology. 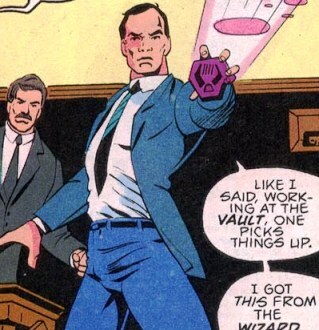 (Cage I#10 (fb) – BTS) – Guardsmen Pascal obtained pieces of illegal technology while he worked at the Vault, such as the Wizard's anti-gravity technology and a Stark-designed device that deactivated Guardsmen armor units. (Cage I#9 (fb)) – While transporting villains the Rhino (whose armor was in another transport car), Animator, and Cinder, Pascal was taunting the villains, causing Animator's control over electrics to overcome their restraints, setting the villains free. 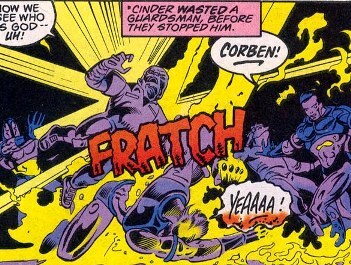 Cinder burst aflame, killing Guardsmen Corben Rubinstein and infuriating Pascal, who beat Cinder to death. 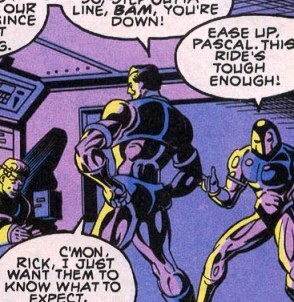 Planning on blaming the Rhino for the crime, Pascal turned as Animator freed Rhino and hit him with an energy burst as Guardsman Rick McLaurin, panicking, tried to make him stop. Pascal killed Rick himself, not willing to stop now, then murdered Animator as Rhino burst free. (Cage I#9 (fb) – BTS) – Guardsman Ravello Medina, in the lead car, ordered Guardsman Marc Danson to take Rhino's armor ahead to safety. He the put together a plot with Pascal to frame the escaped Rhino and let Pascal off free. 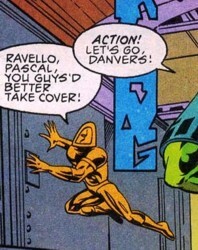 (Cage I#9) – Ravello reported that Rhino had broken free, killed two Guardsmen, and downed Pascal while he sent Danson ahead with Rhino's armor, to keep it away. 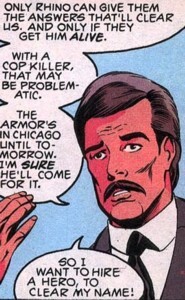 He then reported that Rhino blew up the transport car, killing the other criminals, before escaping. On hold while Internal Affairs looked into the case, Ravello talked to Jeryn Hogarth and Analisa Medina about hiring Luke Cage to find Rhino for him in an effort to clear his name. Cage accepted the case and Ravello told him where Rhino's armor was being shipped from, assuming that Rhino would attack there. Pascal congratulated Ravello on his success. That night, they played cards with Danvers and another Guardsman at the rail site, guarding Rhino's armor. When Cage and Rhino started fighting, Pascal used an anti-gravity patch to knock back the two Guardsmen so that he could handle the Rhino himself. Despite Ravello's doubts, the duo suited up and moved to attack. Thinking they h ad the Rhino in their sites, they blasted him repeatedly, not knowing they were hitting Cage and giving Rhino time to don his armor. Rhino rushed at them, knocking both Guardsmen into an electrified fence, then explained the truth of what happened to Cage. Pascal struggled to fire on Rhino, but his blasters were destroyed, and Ravello finally realized Pascal's desire to murder another man. Frustrated, Pascal callously murdered Ravello, shooting him with a blast to the chest, then using an anti-gravity device to take his head off. He planned to frame Cage for the crime, but Cage and Rhino both fled. (Cage I#10 (fb) – BTS) – After Pascal explained events to the police, his suspension was put on hold so he could help search for Cage and the Rhino. Guardsmen Danson was put on the case as Pascal looked to the police for any sign of the fugitives. 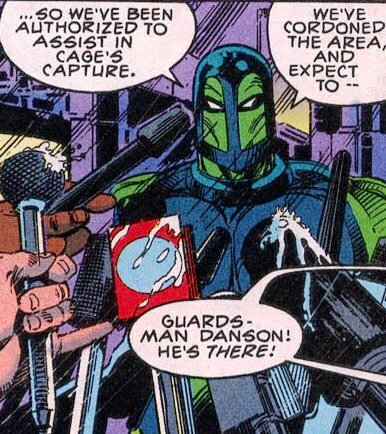 (Cage I#10) – At the police station, Pascal heard the Hulk say he was looking for Cage. In his armor, he trailed the Hulk, who soon found Cage on a train. Pascal flew into attack, but an armored Danson ordered him to hold back and focus on clearing the area of civilians. While Danson held off the media, Pascal attacked anyway, firing on Cage and the Hulk and accidentally opening up the ground into an abandoned coal tunnel. As water flooded in, Pascal began beating Cage, who refused to fight back, as the television cameras recorded him. Danson tried stopping Pascal, who deactivated Danson's armor. Hulk then crushed Pascal's weaponized hands and knocked Pascal out. Cage and Hulk later turned the Rhino back into Danson and the other Guardsmen. Comments: Created by Marc McLaurin, Rurik Tyler, and Joe Rubinstein. These five Guardsmen all received full names in the Guardsmen entry of the Iron Manual, later reformatted for the OHOTMU Hardcover#5. (Cage I#9 - BTS) – Ravello reported that Rhino had broken free, killed two Guardsmen, and downed Pascal while he sent Danson ahead with Rhino's armor, to keep it away. He then reported that Rhino blew up the transport car, killing the other criminals, before escaping. Marc Danson's Guardsman armor possesses the standard capabilities of the Guardsman armor units, including enhanced speed, enhanced strength, offensive weaponry, and flight capabilities. (Cage I#9) - Guardsman Paul Danvers played cards with 3 other Guardsmen, including Ravello Medina and Pascal Tyler, both of whom were on suspension, at a rail site in Chicago, guarding Rhino's armor. When Cage and Rhino started fighting, Pascal used an anti-gravity patch to knock back the two Guardsmen so that he could handle the Rhino himself. Paul Danvers' Guardsman armor possesses the standard capabilities of the Guardsman armor units, including enhanced speed, enhanced strength, offensive weaponry, and flight capabilities. Rick McLaurin's Guardsman armor possessed the standard capabilities of the Guardsman armor units, including enhanced speed, enhanced strength, offensive weaponry, and flight capabilities. Ravello Medina's Guardsman armor possessed the standard capabilities of the Guardsman armor units, including enhanced speed, enhanced strength, offensive weaponry, and flight capabilities. Corben Rubinstein's Guardsman armor possessed the standard capabilities of the Guardsman armor units, including enhanced speed, enhanced strength, offensive weaponry, and flight capabilities.